3d decoupage "Christmas Cupcakes" APA3D003. Threads are Mettler Polysheen 0821, 2101, 5833, 5933. I have decorated the baubles with hobbydots. Along the bottom edge I used Marianne Design CR1273. My friendship card for the month of April was created for Karin. 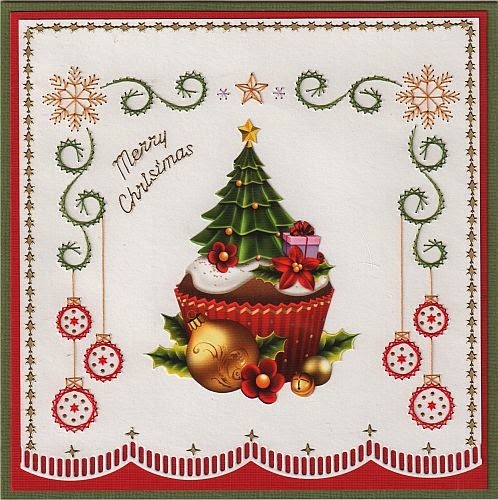 The pattern is by Ann's Paper Art, a655 I didn't stitch the complete pattern. Threads are Mettler Polysheen 2920, 3040, 5833. I created the edge with Spellbinder boarderbilities S5-214. 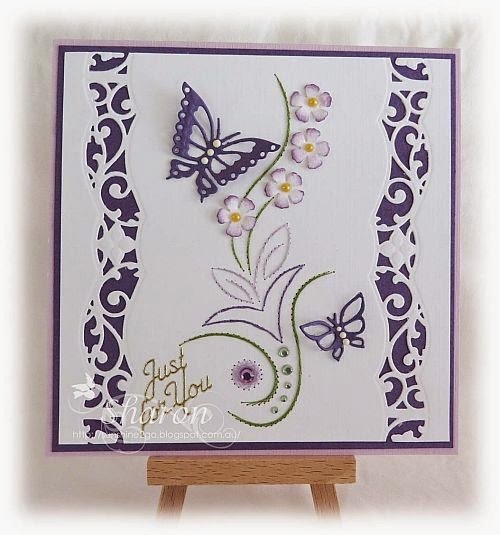 The butterflies are made with the lovely die by Joy 6002/0390. The flowers were created with Tim Holtz "Tattered Flower Garland" and there is a beautiful collection of flowers in the die set consisting of different shapes and sizes. Although you can use flowers of your own choice. I added Distress ink to the edge. butterflies. They are very easy to use and quite effective. Pearls and gems have also been used to decorate the card. I had loads of fun creating this card and I hope that you like it.